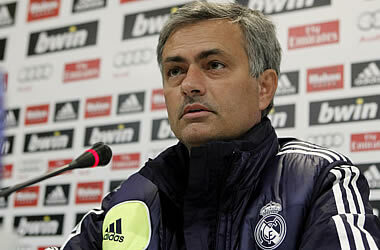 Mourinho: “Benzema and Higuain won’t start together” | The Real Madrid Fan! Following are the comments by Mourinho on tomorrow's first Clasico of the season at Camp Nou. Benzema and Higuain will not play together tomorrow. It is very difficult to say right now which team will play. The team would also like to travel the same day, me too. We will go, rest a bit and play. In games like this, there is enough to get playing time. Teams are prepared. I decided to play with Marcelo vs Ajax and was a good decision. Tomorrow you'll see who gets to play. Our concern is to play well. We are improving significantly. We want to get to the level that made us champions. Ozil, Kaka or Modric? I cannot say if I will play any or none. Last year Pique was fine and stayed on the bench. I cannot think any other coach doing that. I am also glad Puyol is not as bad as it looked. (on Barcelona extending lead to 11 points in La Liga) Let me play the game. Do not want to be pessimistic or optimistic. (on referees) Things have happened since the beginning of the season. But no one at the club has opened his mouth and I'm not going to be the one to do so. I trust my players. Always have. When working well, we obviously get more confident. Total confidence even now. (On Ozil) It is all a drama when a player is on the bench. There are 13 who do not start and then there are stories. The improvement is due to the players. They understood that it was mandatory to change, concentrate more. They deserve the credit. The players have changed their attitude and so it is easier for us that good things happen. (to Marca journalist on Zidane working with the staff to prepare for Clasico) We've not visited Zidane today or yesterday. (on expectations) The world stops. Both teams have responsibility to give world what they want. All three teams have to deliver (Real Madrid, FC Barcelona and referees). You can never predict what's going to happen in these kind of games. They are normally balanced and with equal results. (on Catalan independence agenda) I am only concerned with football and not politics. I am paid to choose the best team and I do my best. Period. I do not know if the draw would be good result, depends on the game. If we deserve to win and draw, it'd be terrible. If other way around, it will be fantastic. There are many months of competition left, concern is to regain the level we had last year. For these games there is a pattern. Two good teams usually but not always balanced.